Taken at 34,000 feet somewhere over Connecticut; inspired by a Dennis Miller rant on air travel. “… what about those masks that drop down in the event of decompression? That’s a pretty flimsy-looking apparatus, isn’t it? 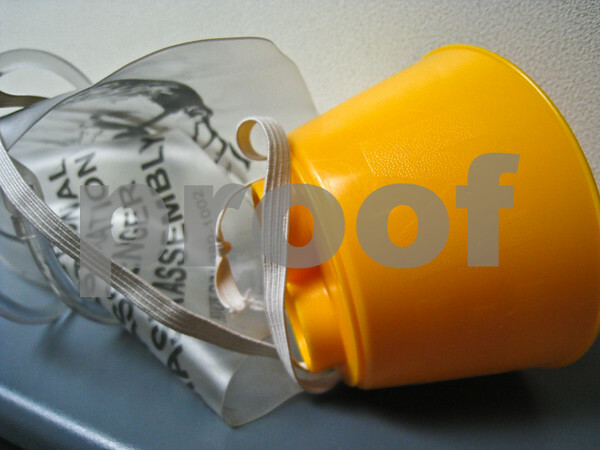 Doesn’t this look remarkably like a Parkay margarine cup on the end of an enema bag or something? They always have these bizarre instructions to start the flow of oxygen, “Tug down lightly on the cord.” Yeah, you know when I’m shoulder rolling at seven hundred miles per hour, “lightly” just isn’t in my f’ing vocabulary, all right? You know people are going to be Conaning those things right off the bulkhead. Something intrinsically cruel having the last forty seconds of your life turn into a Lucy skit. To the nice Southwest flight crew who let me set up this shot in the galley, thanks! And to my cabin mate in 12E - hope you made it to Nashville safely. Nashville is great but hope you didn't get this cough, sneeze, bullfrog voice stuff. I'll try to send you a few pictures of Nashville so on days you are not inspired, you can take a virtual trip to Nashville. If you look closely, you can actually see a bugger on the side of the cup.